Saizen is what you would call a hyakuen shop. It’s the local franchise of the Japanese Daiso chain, and the perfect example of where you can find great travel paraphernalia. Hyakuen shops are Japanese discount dry goods stores that sell everything from kitchenwares and household goods to stationery and gifts, all at one price: 100 yen (hence the name, hyakuen). There’s an inflatable pillow, which is great for those long bus rides or when you’re sleeping underneath the stars; compressed washcloth, which inflates when you take it out of the packaging; compressing bag, which lets you fit everything in your backpack or luggage easily (no vacuum? Just roll it or sit on it! 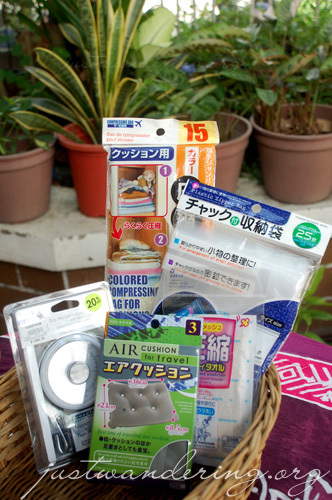 ), and; plastic zipper bag, which comes in the regulation size for your toiletries. Everything is priced at Php 85 in Saizen. 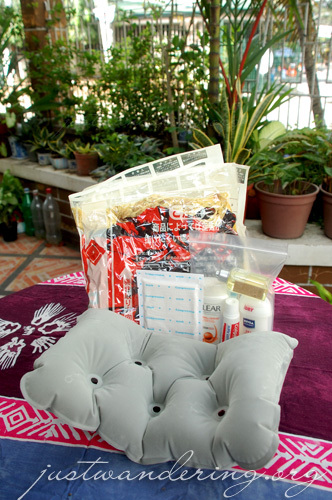 This travel haul costs a total of Php 340. My other travel find was upon Kaoko‘s recommendation. As we were about to check in for our flight back to Manila from Macau, she whipped out this luggage scale. I’ve seen this kind of luggage scale before, so I thought it was nothing special. That is, until she hooked her bag into it and weighed her luggage. It works the same way as similar luggage scales, but what’s great about this scale is that it has a marker, so you won’t have to twist yourself into an awkward position just to see the weight of your bag. As an added bonus, the scale also comes with a tape measure that can measure up to 1 meter so you can check if your luggage meets the cabin requirements. 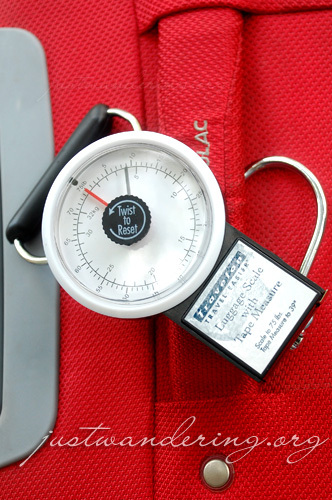 The scale is lightweight, so while it takes up space in your bag, it doesn’t drastically add to its weight. The Travelon Luggage Scale is priced at Php 499 at Handyman. With the 20% discount the store is offering, the price has been marked down to Php 399. Saizen has branches in Robinson’s Galleria (Ortigas), Alimall (Cubao), Marquee Mall (Pampanga) and Trinoma (North EDSA). Handyman has branches all over the Philippines. Thanks to Saizen for the invite to their Trinoma Branch last July 30 and to Robinsons Mall Galleria for the invite last August 1. Hahahaha, your scale. It looks familiar! amhuirnin: Natawa naman ako sa purita mirasol! There are cheaper scales that is similar to this, but the metal felt flimsy and it digs painfully into your palm when you weigh your luggage because it doesn’t have the padding. The pillow does feel softer than the other inflatable pillows I’ve tried, thanks mainly to the holes. Also, with the holes you don’t have to tire yourself out inflating it! Actually, I was browsing through another blog ( Kainpinoy) and was wondering why the last post was way last June. I clicked on “contact” intending to ask why and was led here. Two interesting finds for me today. I’m going to enjoy your travels. Carry on! Take care. great finds! there’s a portable scale pala for luggage. will scour handyman for it. thanks for the tip. Thanks for the tip Nina, this luggage scale is what I want. I’ve only been using the bathroom scale with these awkward positions just to get a clear view of the weight. Thankfully, this one’s available at Bed Bath & Beyond in the US. is this the same as the 99php store? haha nice! National Bookstore sells a travel luggage scale similar to the one you posted… I think I got mine for PhP150-200. Can’t remember anymore because I no longer have the receipt. It’s accurate and can withstand rough handling. Hehe. Oh my, i love the compression packages! And you can’t beat the pricetag. Gonna head on over to Saizen asap. The inflatable pillow is a great find, just the one I’m looking for priced at a very low cost! Thanks for that!